Biblical scholar and theologian Peter Enns presented Samford University’s 2016 Ray Frank Robbins Lecture Feb. 23–25. Samford’s Department of Religion and the Center for Science and Religion cohosted the lecture and other events featuring Enns. 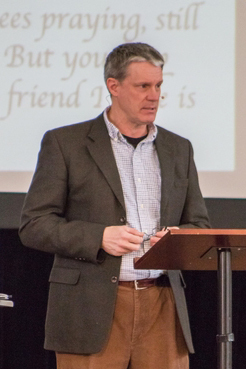 Enns is Abram S. Clemens Professor of Biblical Studies at Eastern University, and the author of many books, including The Sin of Certainty: Why God Desires Our Trust More Than Our “Correct” Beliefs. In his address in university convocation Feb. 25, Enns explored the theme of that book, illustrated with the Biblical passages alternately called the Psalms of lament, or complaint or petition. Enns said many Christians simply “stuff it,” hiding their shame from other believers when they have the kinds of feelings expressed in the Psalms. “You’re not broken if you feel that way,” Enns assured his audience. “You don’t need to be fixed. You’re actually pretty much in the normal range, when it comes to the Christian faith.” He said the Bible holds many places to go when believers feel abandoned, but his own favorite places are the challenging Psalms 73–89, where he finds not only reassurance and praise of God, but also “bracingly honest and unsettling” words about losing one’s grip on faith in God. Psalm 73 expresses frustration at the suffering of the righteous while the wicked prosper, against God’s promise. Enns said the Psalmists, like many believers at some point in their lives, feel that they can neither express their doubts publicly nor hold them inside. But instead of pretending and hoping their doubts will fade, they “enter the sanctuary of God,” and simply tell the truth, as one must in any healthy relationship. “Feeling like God is far away, disinterested or dead is woven into the Biblical fabric and can’t be brushed aside,” Enns said. But, he observed that although some of these Psalms end without resolution, the last of them, Psalm 89, includes the “very intentional ending of ‘Blessed be the Lord, forever, Amen, Amen.’ Even in suffering, the Psalmist moves toward trusting God anyway, when all the evidence is against him,” Enns said. “I think that’s the real way forward.